Challenge yourself to cook 90 simple meals in a month, and reboot the way you eat, cook, and feel--from the editors of Epicurious, the web's most trusted recipe site. It's easier than you think. For 30 days, challenge yourself to cook every meal--and you'll transform the way you eat and feel. With expert support from the editors of Epicurious, the web's most trusted recipe site, you'll say goodbye to pricey takeout, crummy pizza delivery, and fast food that's no good for you. And you'll say hello to all the benefits of home cooking: healthier and more delicious meals, a fatter wallet, a clearer mind, and sharper skills. And you'll do it all without upending your life. By repurposing leftovers and planning ahead, you make cooking work for your schedule, not the other way around. 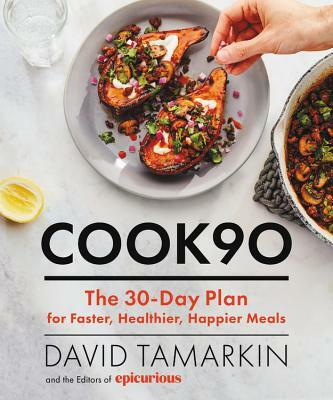 David Tamarkin is the Editor and Digital Director of Epicurious. His recipes and articles have appeared in Bon Appetit, Gourmet, Details, Food Network Magazine, Time Out Chicago, Time Out New York, Every Day with Rachael Ray, Conde Nast Traveler, Cooking Light, Wine & Spirits, and many other publications.